Oakland Mayor Jean Quan. File photo by Luke Thomas. 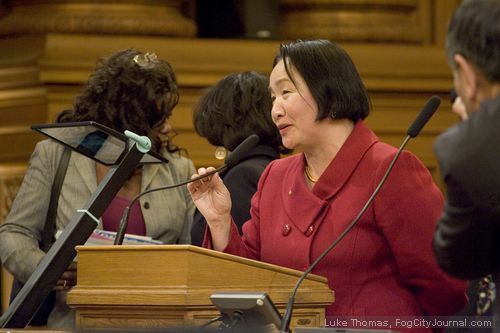 OAKLAND — Local workers affiliated with the Alameda Labor Council today expressed strong support for Mayor Jean Quan, vowing to defeat any attempt to recall her. The show of support follows a resolution to oppose the recall adopted by delegates of the Alameda Labor Council on December 5th. The resolution adopted by delegates to oppose the recall says the recall would hurt the city during a time of continued economic uncertainty. Workers cited the Mayor’s longstanding commitment to working people at today’s press conference. The Delegates resolution also draws attention to the critical public safety efforts Mayor Quan is leading and highlights her success in building Oakland’s first public safety plan that unites law enforcement and schools to combine community policing efforts and targeted work with youth and families. The Alameda Labor Council, AFL-CIO is committed to building a progressive city government that serves the interests of working families. We believe our energy and resources are best served by building safe and healthy communities, tackling our shared challenges, and creating good jobs. Comments for Alameda Labor Council Vows to Fight Quan Recall are now closed. Labor Unions once again show their self serving heads. labor Unions only come out to play when it is in their serving interests. Once again they have played the OWS movement as a bowl movement.